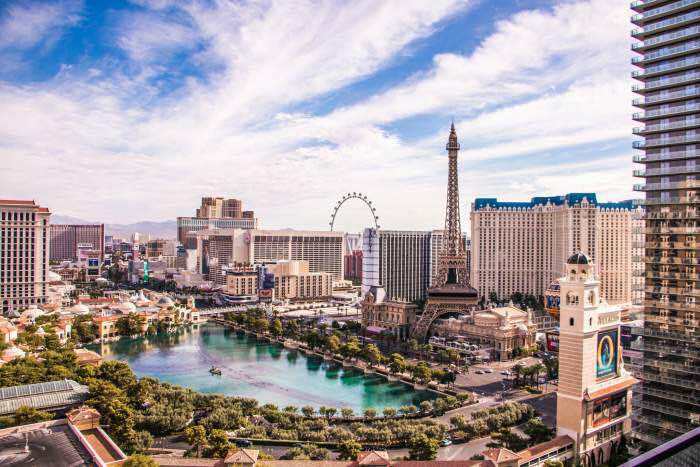 Here are free things to do in Las Vegas in 2019 to keep you occupied during an entire trip - day or night! 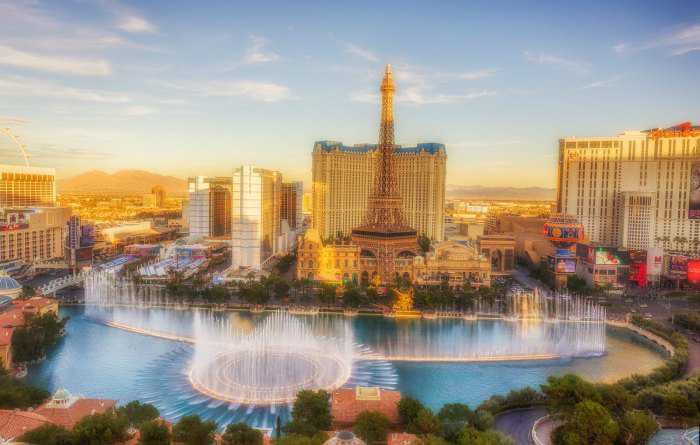 Most of these free attractions and activities are located on the Strip and are suitable for Vegas vacation with kids and teens. To keep you concentrated, we have created an easy to follow map and a step by step guide to the most fun free shows, attractions and activities along the Strip and up until downtown. We have also provided approximate times and schedule of free Las Vegas shows so you can easily plan your vacation! Ready? Put on your sturdy shoes, or rent a car, and let's go! 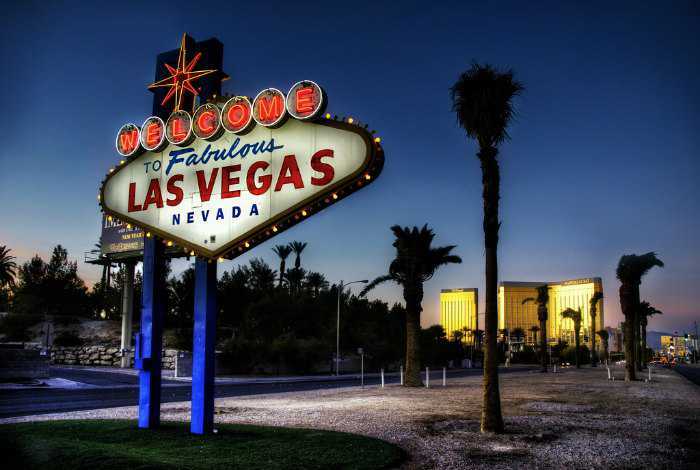 We start our trip right at McCarran Airport - near the famous sign, and walk (drive)along the Strip towards downtown. We will be stopping at the most interesting hotels and other venues that are worth popping in either for a quick look around, exploration or for a free show. By popular demand, we created a FREE printable book of Free things to do in Las Vegas. The sign was designed by Betty Willis, a graphic designer, in 1959, and changed the address a few times until moving to 5100 Las Vegas Blvd. S., near McCarran Airport, right where the Strip with all free attractions begin. The 25 feet (7.6 m) sign is not only a perfect photo opportunity, it's also a place where many people choose to get married! We leave the sign and continue along the Strip. Our next stop is Luxor Hotel. Although it doesn't offer any free shows to see, it has a couple of other free things to do in Las Vegas. First thing you will notice is that Luxor is built in the shape of an ancient Egyptian pyramid - in particular, Pyramid of Khafre located in Giza in Egypt. As with Pyramid of Khafre, Luxor is guarded by a great Sphinx statue - although the Vegas version is newer, the resemblance is striking. 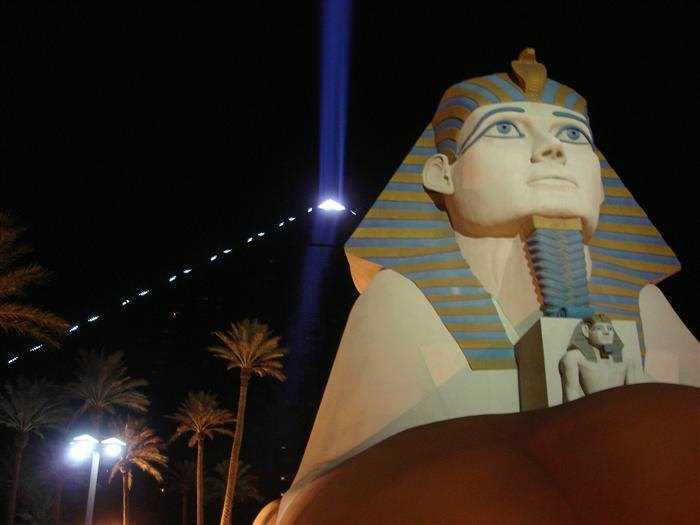 If you happen to be passing by Luxor hotel at night, you will notice another interesting landmark - the Sky Beam. In fact, you will notice it almost from anywhere in Las Vegas - it's the brightest light beam not just in Vegas, but in the entire world! If you want a proof - try one of those night helicopter rides. Produced by a combined effort of energy-efficient 39 Xenon lamps that keep Luxor's electric bills just a bit higher than average, the Sky Beam is visible from 250 miles away! In case you are wondering why Luxor has a Sky Beam - the hotel's version is that ancient Egyptians believed that after death their souls would travel to the sky in a beam of light. We think that it's one of the most fun free Las Vegas shows. Our next stop is MGM Grand Hotel. If you happen to be passing by between 10 am - 8:30 pmand if the activity we are describing below sounds like fun to you - be sure to pop in! MGM Grand is home to CBS Television City Research Center, where the notion of free things to do in Las Vegas gets an entirely new meaning. The Research Center is the place of where big decisions regarding the destiny of new TV shows are made. And guess who is helping to make the decisions? They rely heavily on tourists like you and me to watch shows, pilots and other TV programs and rate them honestly. The Center is located at the Studio Walk - MGM Grand's shopping center. Screenings change every 30 minutes or so, and the Research Center attracts just a modest crowd, so you won't need to wait too long for your turn to watch and decide the fate of the next show. After you've watched a show, you will evaluate it by completing a questionnaire. After you are done, don't forget to pick up coupons for food and merchandise that the Research Center offers to reward your input. 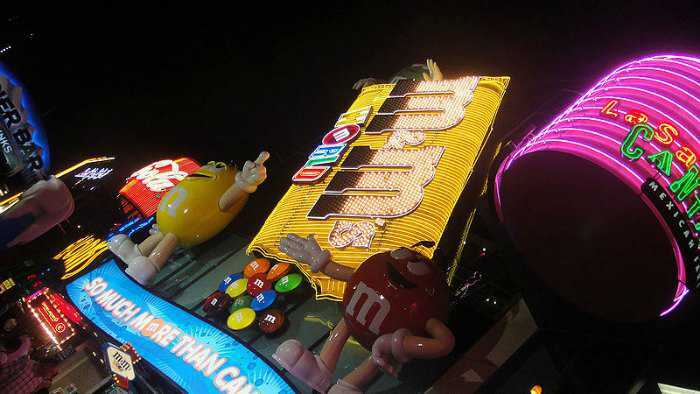 As you are passing by MGM Grand, especially if you are with your kids, you could also drop by M&M World located nearby - it's a paradise for chocolate lovers, and is free to enter. Although it would be hard to walk around and not buy something! Our next stop is New York New York hotel, themed after New York City. Of course it would be impossible to recreate an entire city on such a small territory, so what they did was take the most famous NYC landmarks and throw them in together to create this masterpiece. We are not going inside as they don't really offer free shows right now, and the hotel is not as themed inside as it once was. But there is plenty of free things to do in Las Vegas outside. Other than the obvious Statue of Liberty and NYC skyscrapers that are approximately 1/3 size of the original, we'd like to draw your attention to a few other landmarks featured at New York New York Hotel Las Vegas. Now try and guess which one is the original ! (Just kidding - it's pretty obvious). Our next stop is CityCenter. CityCenter is an urban complex that consists of several beautiful, modern hotels that have one thing in common - a water and crystal theme. The complex has a shopping mall called The Crystals. Hotels included in the CityCenter are Aria, Vdara. There are also Veer Towers that are actually condominiums. We will briefly look at the hotels located inside CityCenter to notice the beautiful design. 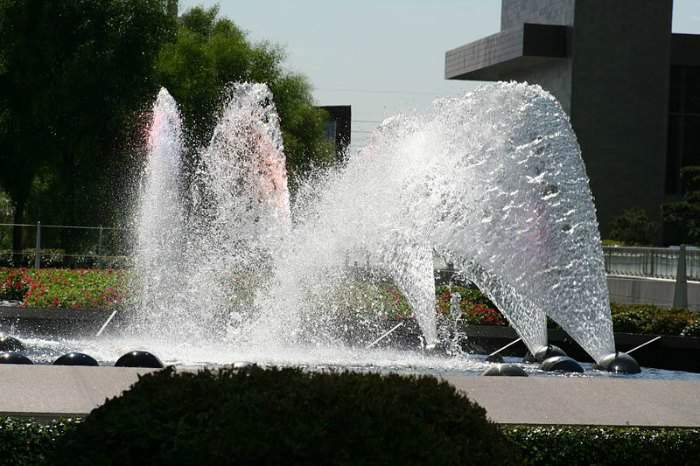 We'd like to draw your attention to many water features located outside of Aria Hotel. If you have the time, walk inside Aria, too - they have plenty of free artwork displayed everywhere. If art is your thing, you won't find any better free things to do in Las Vegas! As they say at Aria themselves, always look up - you might find something interesting there - for example, a silver replica of Colorado River installed in the lobby. 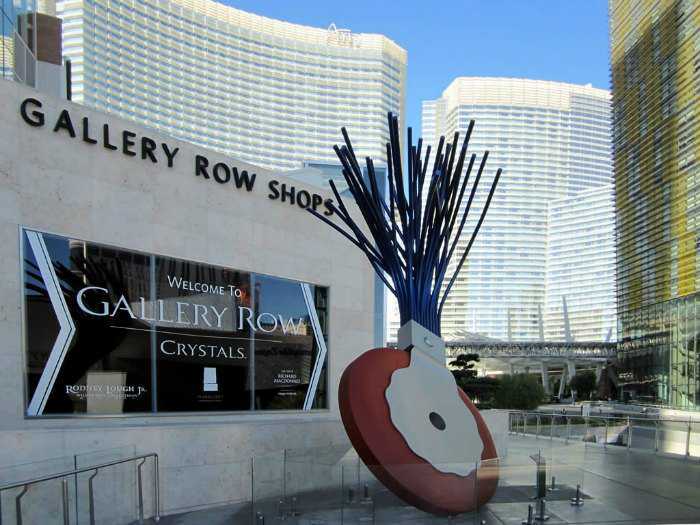 Still in the CityCenter, we will proceed inside The Crystals shopping center, that currently feature one of the coolest free Las Vegas attractions - the art gallery by Dale Chihuly - a glass sculptor whose work decorates the lobby at the Bellagio Hotel. 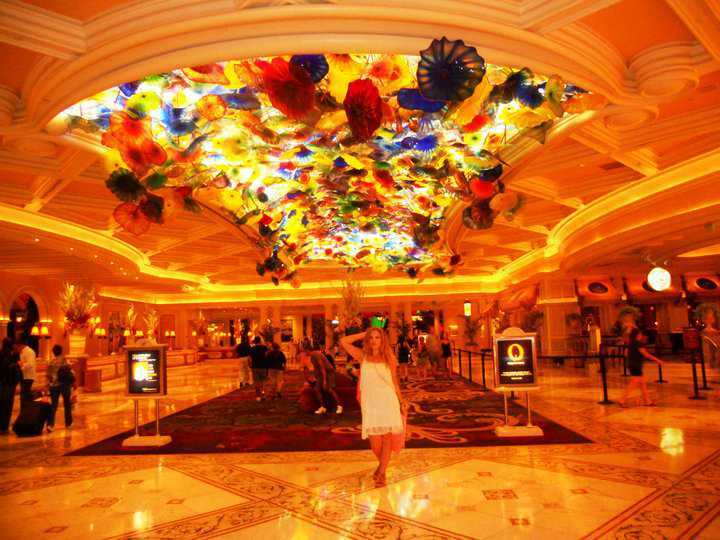 The first thing you notice when you come inside the lobby of Bellagio is a beautiful glass sculpture Fiori Di Como by renown sculptor Dale Chihuly, whose work is also displayed inside CityCenter, and in many art museums in the USA and in the world. The Fountains are located outside of the hotel, so you don't need to come in for the most incredible of all free things to do in Las Vegas. The Fountains run on schedule, from every 15 minutes to every 30 minutes during operating hours. Current hours is Monday - Friday from 3:00 p.m. to 12:00 p.m, Saturdays and Sundays - from 12:00 p.m to 12:00 am. On Sundays, the show runs starting at 11:00 am. 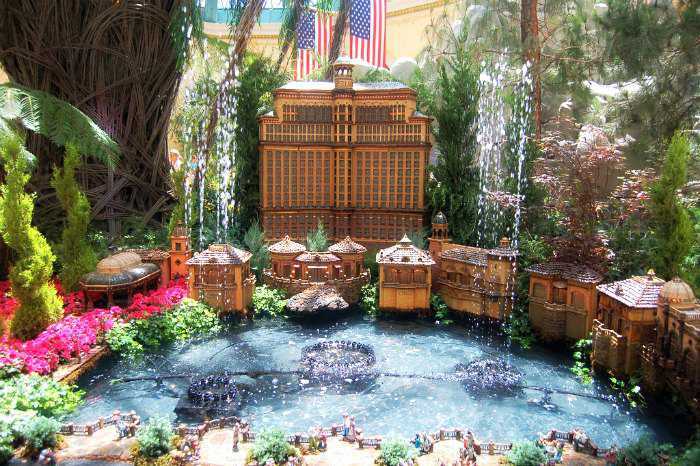 Another great free attraction located inside Bellagio is the Conservatory and Botanical gardens. This one can be viewed any time, as it's open 24/7. The Botanical Gardens are among "must-see" free Las Vegas attractions, even if you are not into "flowers" - it may even change your mind! They change the theme several times a year. Currently they offer the following themes: Chinese New Year, Spring Celebration, Summer Garden, Fall Harvest. 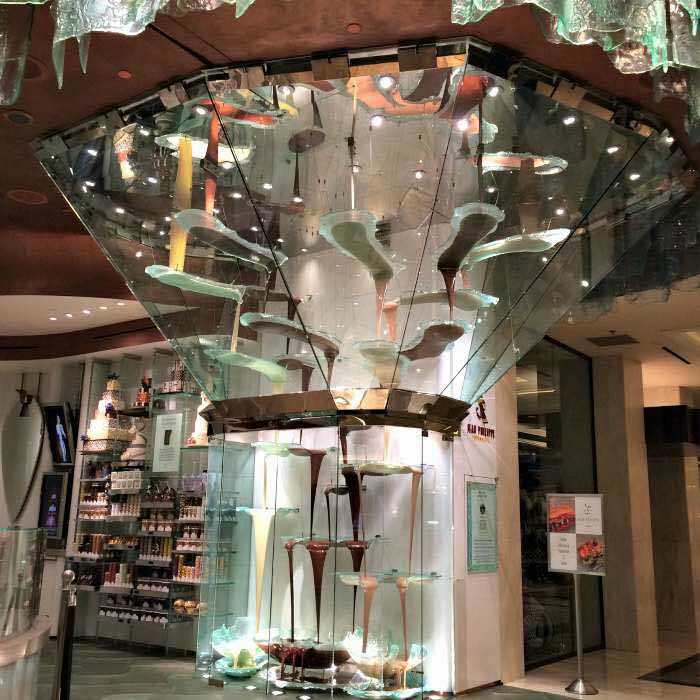 If you have the time, check out the largest chocolate fountain in the world located inside Jean Philippe Patisserie. The fountain in free to watch, unlike chocolates in the Patisserie - umm, well, yum! 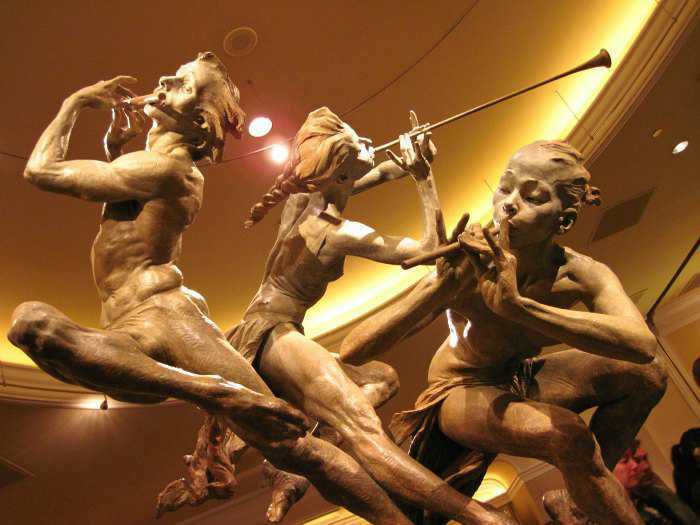 The Art of Richard MacDonald is located inside O Theater that runs one of the most popular Cirque du Soleil shows - O inside Bellagio. If you can't afford the show, you can watch the collection of bronze sculptures created by Richard MacDonald, that capture Cirque du Soleil artists in all their glory! As we leave Bellagio, we will pass by Paris Hotel. There is no need to go inside as they don't run any actual free shows, but we will find plenty of free things to do in Las Vegas outside the hotel (unless you want to take a close look at the replica of Le Pont Alexandre III from Paris located inside the hotel. The hotel's main attraction - Eiffel Tower - is hard to miss. It's free to explore it from the outside, however, if you want to ride the elevator and check out the Strip from top of the Tower - it will cost you $7.50 to $22.00 or, will be free with Power Pass that grants access to multiple attractions and plenty of free Las Vegas shows and things to do. Eiffel Tower is almost exact replica of the real thing, except twice as small. Our next stop is Flamingo Hotel - home to Flamingo Wildlife Habitat. Now this stop is really necessary in 3 cases: 1. You love flamingos, 2. You've never seen them, and 3. You have kids. Otherwise, you can do without it. 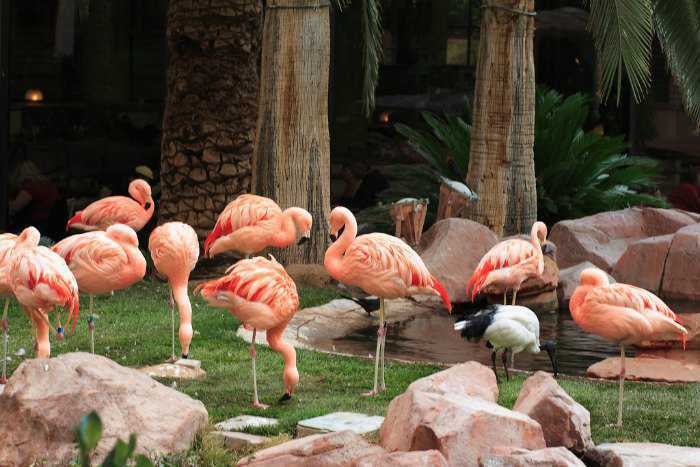 In the habitat, flamingos simply walk around among hotel guests. Don't get us wrong, they are quite pretty, but if we are looking for free things to do in Las Vegas, we want more than just walking birds! Caesars Palace Hotel & Casino; Address: 3570 S. Las Vegas Blvd. Next stop - Caesars Palace Hotel and Casino - the one you saw in the hit comedy "Hangover"! And if you are still wondering - no, Caesar never lived here. Although if he lived in the 21st century and wanted to have a palace, he would probably choose this place. There are plenty of free things to do in Las Vegas at Caesars Palace. The first thing you notice is Roman statues, including a reproduction of David by Michelangelo. Take your time and have a look around, if you like statues. 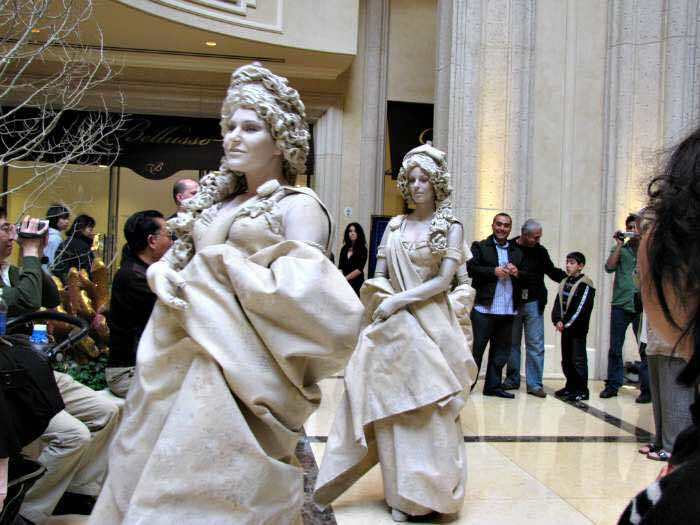 But now you probably heard about moving statues at Caesars Palace which is among the most famous free Las Vegas shows. However, not all the statues here can move. 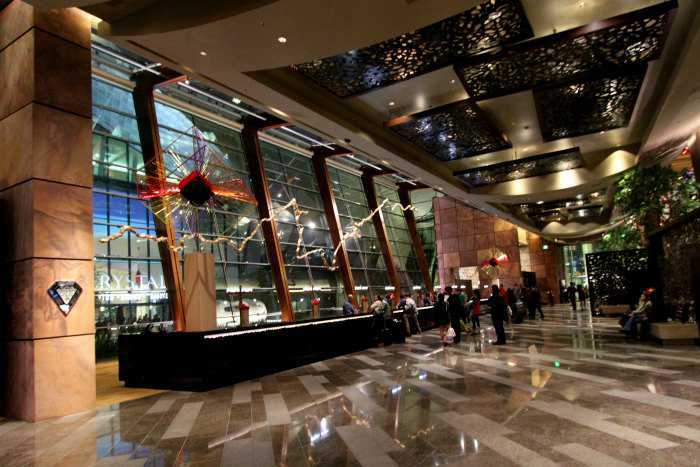 To watch the show, you need to go to Forum Shops - a shopping center located inside Caesars Palace. The Fall of Atlantis show, using animatronic statues, runs every hour starting at 11:00 a.m. and until 11 p.m or 12 p.m. The show tells the story of a feud between a brother and a sister, who can't decide who will rule Atlantis. They fight using water and fire, gods interfere, and Atlantis falls...to rise again the next hour. I can't think of another city that falls and rises that often. 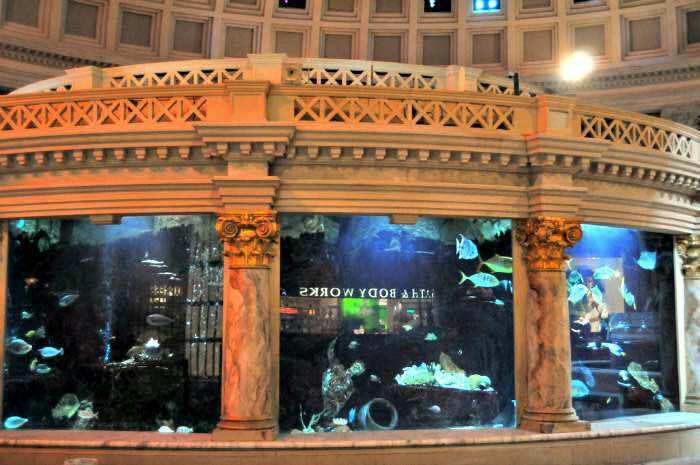 As you are exploring the Forum Shops, notice the aquarium, located near the Fall Of Atlantis show. And finally, before we leave Caesars Palace, take a quick look at Colosseum - that looks pretty much like the real Colosseum in Rome. This is the venue where sing Celine Dion, Rod Stewart and Elton John. The Mirage Hotel & Casino; Address: 3400 S. Las Vegas Blvd. Now let's move on to The Mirage Hotel. 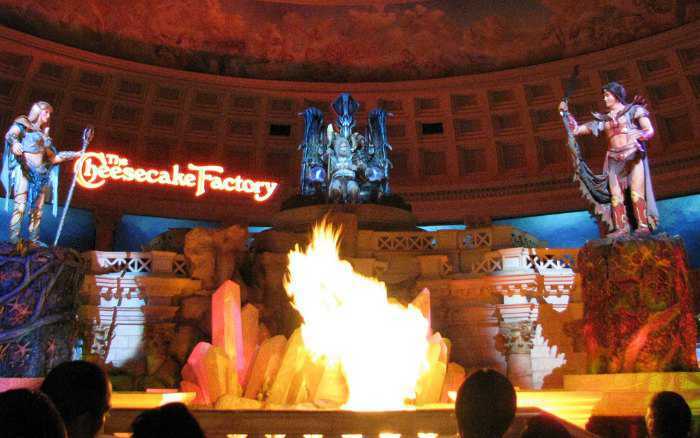 Mirage is known for the most "explosive" shows performed by a an artificial erupting Volcano installed in front of the hotel. The show runs every hour from 7:00 p.m. to 11:00 p.m. nightly. The show is accompanied by music (I wish real volcanoes followed this example!). When it's not erupting, the Volcano turns into a peaceful waterfall. Again, a great example for all other volcanoes. As it's one of the most popular free Las Vegas shows, be sure to arrive in advance - it gets quite crowded her. Saw the volcano? Don't leave yet! 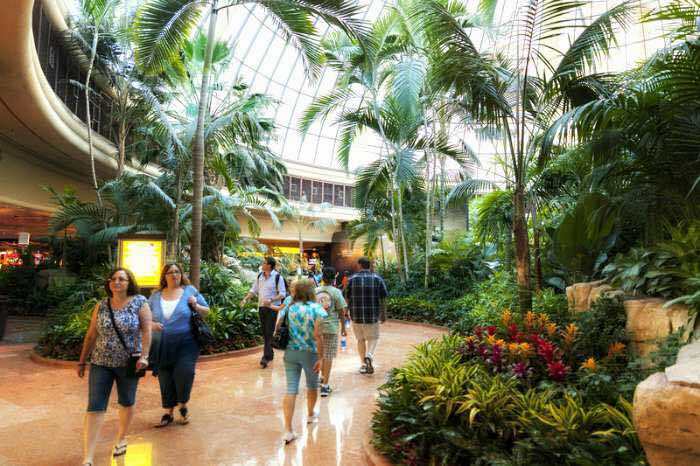 Pop inside the hotel to check out the tropical rainforest (atrium) of The Mirage. It really creates illusion of a mirage in the middle of a desert - very beautiful and smells so nice. And if you have kids, or love fish (or fishing!) 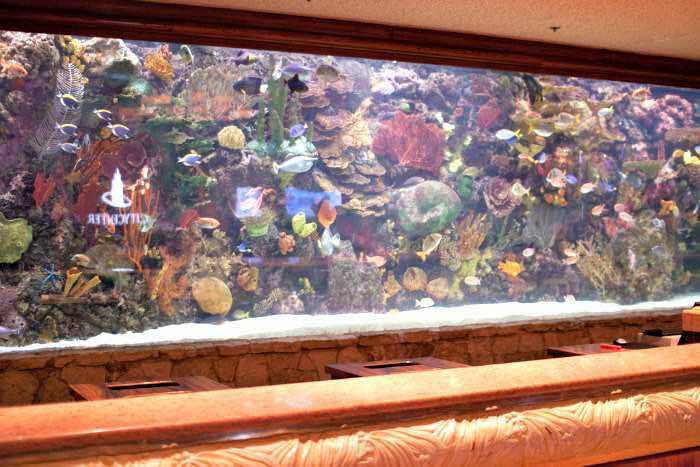 and the aquarium at Forums Shops wasn't enough, check out the Aquarium inside the lobby of the Mirage. The Venetian Resort & Casino; Address: 3355 S. Las Vegas Blvd. 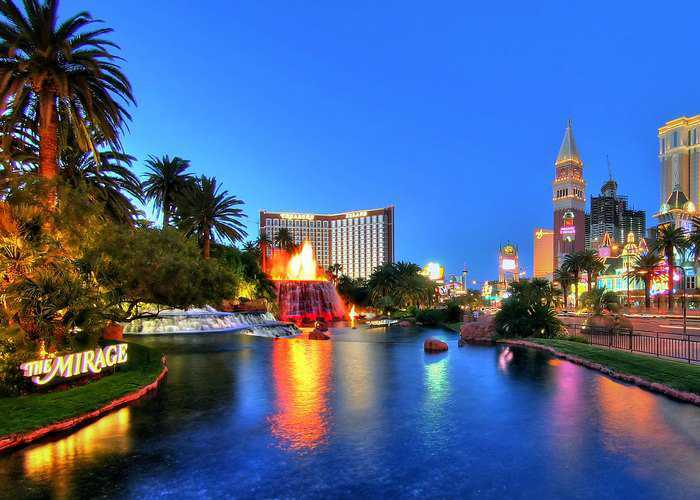 As much as we love fish and rainforests, we need to move on - we have completely different free things to do in Las Vegas waiting for us at The Venetian Hotel, or, in particular, at the Grand Canal Shoppes. 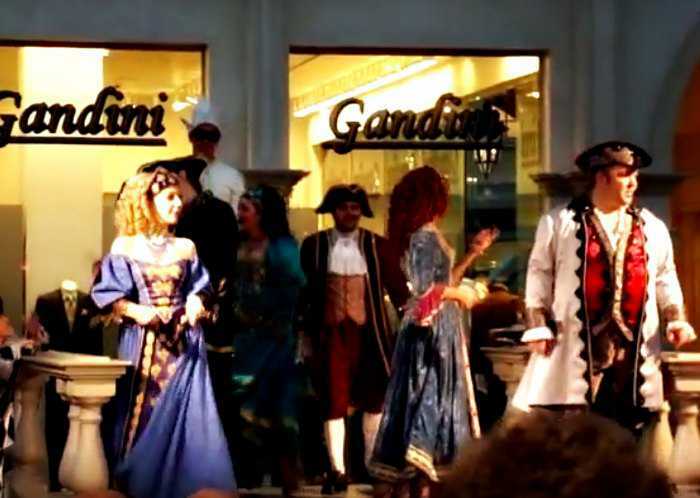 Here, we are going to watch a beautiful Italian themed production of Carnevale di Venezia, also known as Streetmosphere - incredibly beautiful free Las Vegas shows, where "Street" performers dressed in costumes of Italian Renaissance period, sing Italian songs and opera. They have a complex schedule, but performances start at 12:00 p.m. and last until 6:30 p.m. You can find performers at the St. Mark's Square or Barney's New York. Don't leave yet! Did you like statues at Caesars Palace? Well here at The Venetian they have something almost just as cool (or spooky - depends on how you look at it) - the living statues. These are actually people dressed as statues that move very little. A proof that in order to work at The Venetian you either need to sing or to move to stand still for hours. So far we've seen a huge diversity of free things to do in Las Vegas, attractions and shows! Now get ready for something new - free fashion shows! Yep, that exists in Las Vegas - the city where dreams come true (provided you dream about free catwalk shows). To see this, you need to arrive at Fashion Show Mall on Friday, Saturday or Sunday between 12:00 p.m. and 6 p.m. The show runs every hour on the hour. Address: 2880 S. Las Vegas Blvd. So you can't afford Cirque du Soleil, but still want to see a circus show while in Las Vegas? We hear ya! therefore, our next stop will be Circus Circus hotel - where circus never stops! 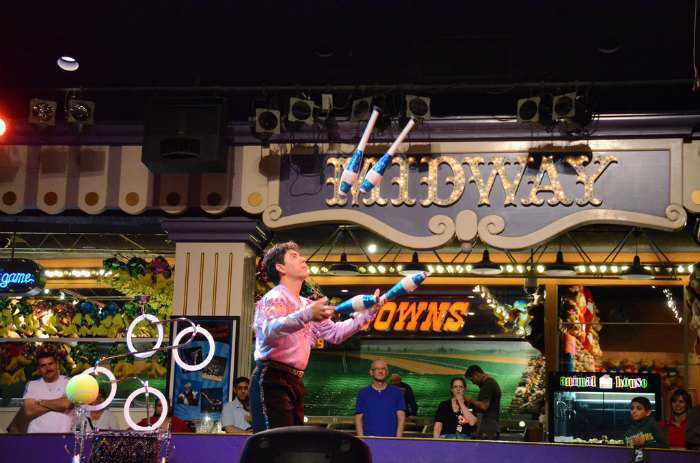 Be sure to arrive to the Midway located inside the hotel at 11:00 a.m. - because that's when the fun begins. Well let us tell you - it's not Cirque du Soleil, but these free Las Vegas shows are the next best thing. You will see acrobats, jugglers, clowns and pretty much everything that comes to mind when you think of a circus - except animals. Now that you think you've seen all free Las Vegas shows, we have a something fun for you. We are going to watch people tumble down from the top of Stratosphere hotel! In case you want to jump - it will cost you $119.99 (see more thrilling things to do). But watching others scream with fear is absolutely free and might fill you with a fuzzy, warm feeling of safety and happiness that you are not there! 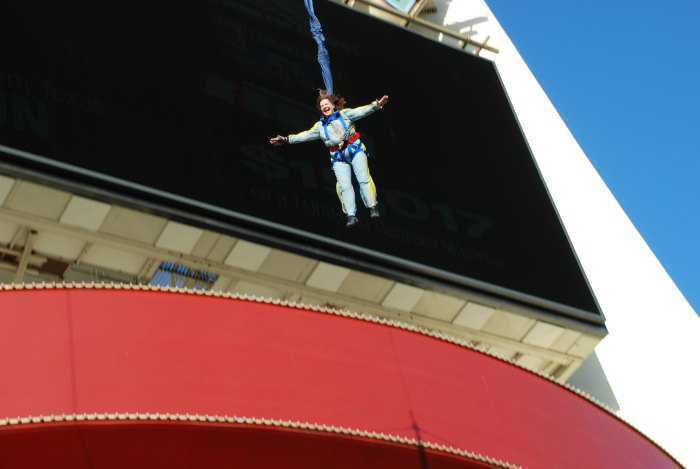 You can catch people jumping any time between 10:00 a.m. and 1:00 a.m., and on Friday and Saturday until 2:00 a.m. You can watch the jumps from the ground, or even on a big-screen TV in the SkyJump store. 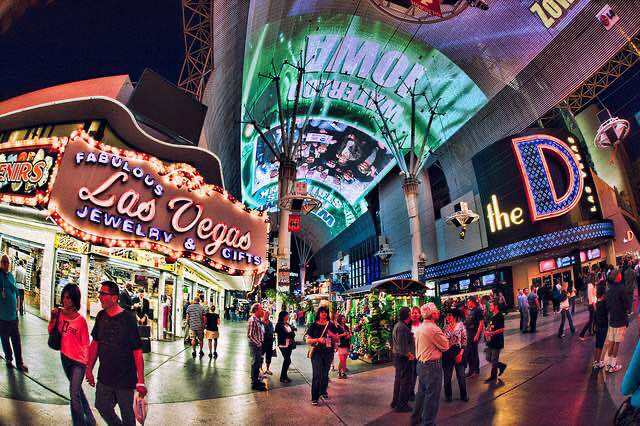 Now that we've seen all or nearly all free attractions on the Strip, we go to downtown for a taste of "old Vegas" - the Fremont Street Experience. Be sure to arrive any time between dawn and dusk to watch a grandiose show of light and sound on the large LED canopy installed on top of the Fremont Street Experience. The show of light called Viva Vision runs every hour on the hour and each show is about 6 minutes long. Other than Viva Vision, Fremont Street Experience offers plenty of free things to do in Las Vegas, including daily live music concerts on 2 stages, played by various bands. Think you have seen it all on The Strip? 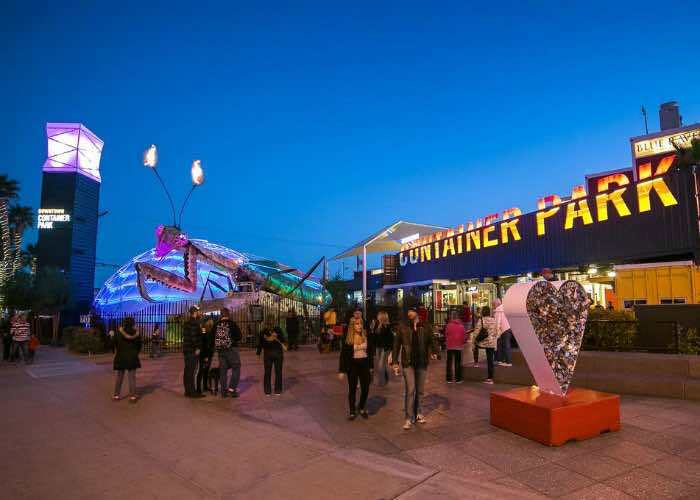 Head over to Downtown Container Park for more fun free things to do in Las Vegas in 2019. Located on the corner of Fremont and Seventh Streets across from El Cortez Hotel & Casino, the Downtown Container Park is the funky local shopping center, made out of shipping containers. But it's not just a shopping center - here you can experience the wonderful creative artwork like the fabulous Praying Mantis who shoots fire. The Mantis was presented at the annual Burning Man Festival and now resides at the entrance of the park. With over 19,000 square feet at the Downtown Container Park there is fabulous food, drinks, creative artwork for your eyes to feast upon, slides and playgrounds, as well as other entertainment options. 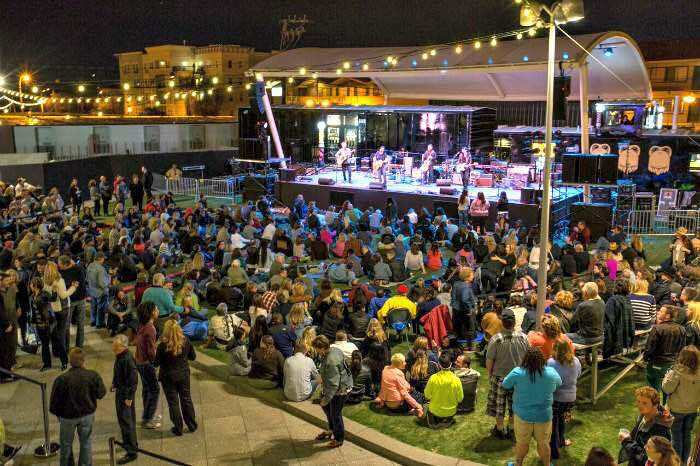 The Downtown Container Park is also a great way to entertain the family and enjoy some outstanding free things to do in Las Vegas on the weekends. You can dance to local bands that put just the right beat into a fantastic night of music.